There will NOT be a CSA produce delivery next week, Tuesday, July 6th! In the past, Shain planted our crops in succession, meaning he spread the plantings out over a longer period of time to ensure a more steady and consistent harvest. This year, the rain made succession planting impossible. Shain had no choice but to plant everything at once. The crops that he was able to plant on the rare occasion when it was dry were extremely slow to germinate and grow in the cool, wet weather. The result is there will be a lot of food coming on all at once in August and September. Not so much in July. About half our CSA members are loving all these radishes and turnips. The other half of you are not. Personally, I love the turnips, but not the radishes. Can't make everyone happy all the time, not even the farmer's wife. Tomato plants growing in greenhouse #3. Started from seed around the first of March. Already about 3 feet tall, with blossoms and small green tomatoes. Greenhouse #4 is also full of tomato plants, about 100 of them. They are about half this size, and growing quickly! We started harvesting from some of the "outside" rows of salad today. Unfortunately, we are already finding caterpillars in the greens. They come out in force as soon as the weather gets hot. The turnips have really grown this past week! We harvested just the biggest sized turnips and still ended up with over 900! Divide that by the number of CSA shares we have and it means you are all getting a very large bunch of turnips this week. If you haven't developed a fondness for them already, maybe this week you can experiment using turnips and turnip greens in some new recipes. I added a new recipe to this blog for Ham Hock & Turnip Greens, provided by one of our CSA members. Your share is limited to only the two items this week. This is our transition period where the early season, inside crops (grown in the greenhouses) are just about gone, and the outside crops (grown in the fields) aren't quite ready. No matter how dutifully Shain plans and prepares, it seems we usually have a gap in our produce production this time of year. This year we can blame it on those few weeks of nearly constant dark and rainy days. Taking last week off harvesting for the CSA was very helpful. Thank you for your understanding. We were able to do a lot of weeding, planting and other projects. Shain is feeling better about having necessary crops planted. However, we are not feeling the same about the weeds. In particular, the thistle has taken over patches of our fields like we've never seen before. So we weed...everyone...together...a weeding party! But in all seriousness, Shain has been spending a lot of time on the internet researching organic and sustainable methods of controlling weeds, especially the dreaded thistle. There are a lot of ideas, methods, and tools available to help us win this ongoing battle. He is very determined and I'm certain he'll figure this out. Meanwhile, I am literally dreaming about weeds. It keeps me motivated to get up the next day and attack another row. Ever wonder what it looks like when a plant has bolt or "gone to seed"? A plant is said to have bolt when it goes from being mostly leaves to mostly flower and seeds. This is usually due to hot weather. When the ground temperature goes above a certain level, the plant very quickly abandons almost all leaf growth and puts all it's energy into producing flowers and seeds. Why? It's the plants survival mechanism to ensure the next generation (in the form of seeds). Once a plant starts to bolt, it puts it's entire reserve energy into producing seeds, so the rest of the plant becomes tough, tasteless, or even bitter. If you can catch a plant in it's very early stages of bolting, you can temporarily delay the plant's rapid decline by cutting off the flowering stem. But for most plants this will only give you a little extra time to harvest before the plant is inedible. And as you can see in the photo above, bolt can occur in any stage of a plant's growth cycle. In the front row are newly transplanted baby Chinese Cabbage. Nearly 50% of these transplants have already bolted, so this second crop is not likely to happen. Just too "hot" now for cabbages. The back rows are bolting pac choi plants. We've had a great harvest of pac choi this year so we aren't too upset about these last remaining plants going to seed on us. Pig Food. IMPORTANT: There will NOT be a CSA Delivery next week, June 15th. Weeks of rain have created some urgent setbacks that must be taken care of ASAP. The weeds are loving the moisture and overtaking several previously planted crops. Shain is behind on getting crops planted because the ground is too wet and muddy to work. Taking a break to get caught up now will help us do a better job of providing you produce in the future. Thank you for understanding. Napa Cabbage and/or Chinese Cabbage (not enough for everyone to get one of each, so some are getting two Chinese Cabbage instead). That's it for this first planting of Chinese and Napa Cabbages. We've got a second crop of cabbages growing but we'll have to see if they will grow nice heads of lettuce or revolt on us and go straight to seed, which some of them are already doing. More new baby animals for 2010. All for the sake of SOIL FERTILITY. Three piglets - known around here as the "compost makers". They will live very happy lives here eating old, ugly, rotten produce all season long. And taking long of naps in shade. What more could a pig want? About 25 Cornish Cross chicks which are a type of meat bird we will be raising in the new chicken tractors. They have a very important job to do: eat bugs, fertilize, eat weeds, fertilize, eat weed seeds, fertilize, eat old produce, etc. Shain is determined to incorporate better methods of increasing our soil fertility on the farm through our own resources. Bringing in old horse and cow manures has also brought in a lot of weed seed. Weeds are overtaking sections of the farm and consuming way too much of our time and energy. Weeds are the enemy! While raising farm animals also takes time and energy, I'd rather take care of pigs, goats, and chickens then spend days in the fields picking weeds! *It's important to remove the tops from your radishes and turnips ASAP after you receive them. Otherwise, the upper leaves will continue to draw moisture from the edible radish or turnip root which will then become soft and less desirable. This rule applies to all root crops. Removing the leafy tops will keep the edible root portion fresh, crisp, and full of moisture. Speaking of leafy tops - they are edible. You've most likely heard of turnip greens before, but radish greens are also edible (although their flavor is quite strong). These greens are full of extra healthy vitamins and nutrients. Try it! From a Beth, one of our long time CSA members and Workshares - "Radish Greens: Sauteed them in a little raw coconut oil on the side of the same pan I was cooking the chicken. Delicious." We hope you are enjoying the bounty of greens we are providing during these first weeks of the CSA season. Shain's plan this year was to pack in the greens early in the season before the bugs come out with warmer temperatures. Why fight the bugs so much when we can simply grow the crops they love to eat before they hatch. It helps that we added a 5th greenhouse last year and now have the space to do this. Shain's plan is working in this regard very well. Tell us what you think. Too much or just right? Overwhelmed or loving it? 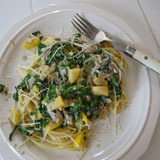 I just went back and reviewed our CSA Newsletters from May and June 2009. We didn't have any cabbage or pac choi in the shares until June 23rd! Wow! 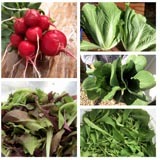 This year, by growing them early in a greenhouse, they were in your shares May 18th, our second week of the CSA season.